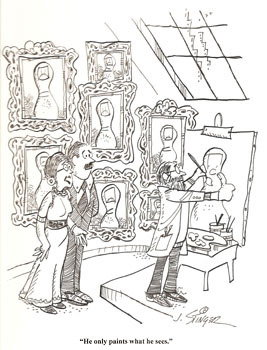 Many professional painters have other artistic talents including John who has been selling cartoons to magazines, newspapers, newsletters and trade publications since he was 16. In the military, his weekly panel called Stingers Stunner punning the top brass, was syndicated and distributed to military bases worldwide for four years, earning him two departments of Defense Citations and named him Top Military cartoonist for two years. 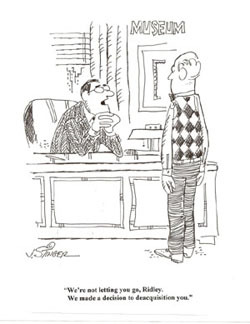 After active duty, he returned home and syndicated Big Business, a single daily panel cartoon spoofing the power of large corporations, many years before it became fashionable. His work appeared in 65 newspapers in the US and Canada, including the Los Angeles Times. The cartoon ran for five years and was featured in the business or financial sections. In 1992 while working as a Vice President for a NY/NJ based advertising agency, he authored and cartooned his first book, I Buy Junk. I Sell Antiques, published in New Hope, PA. The book is a satire about the fun in chasing treasures. Its still in circulation and sells as a collectible on the Internet for $65-$70, not bad for a $9.95 paperback! For the past several years when he is not painting beautiful landscapes, John sells monthly cartoons to a variety of magazines and publications that serve the growing vintage, antiques, art and collectibles market segment- an area where he has considerable expertise as a collector and dealer for over thirty years. He calls the cartoons, Stingers Collecting Classics © and will feature one a month on his web site for the fun and entertainment of his clients and visitors, who usually stop by to see his latest landscape paintings. 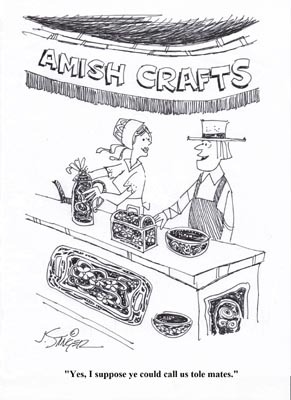 Details: Collecting Classics © by John Stinger is a monthly single panel gag cartoon that appears in a number of national and regional publications serving the antiques, vintage and collectibles markets. Uses: Publications, newspapers, magazines, web sites, newsletters, announcements, ads, brochures and other promotional materials. Delivery: High res cartoons are distributed via email or sent regular mail. 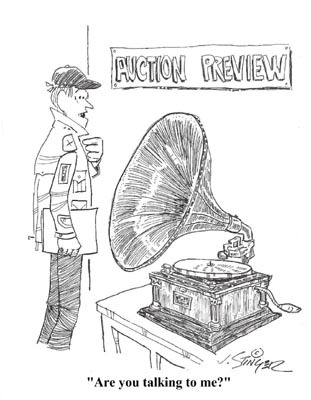 Cost: Varies based upon circulation and publication rights purchased - from $15- $75 per cartoon. The feature is available weekly, monthly, bimonthly and quarterly. Discounts given based upon quantity ordered. Custom cartoons and humorous illustrations are available from $50- $150. *Other Cartoon Subjects: Stinger also does cartoons about seniors, artists, corporate business, women, and medical subjects including doctors, health care, and physical therapy. Costs and availability are the same as above. corporate communications executive, antique dealer, art collector and book author. For more information call 908-319-8957 or stingerfineart@yahoo.com. For individual hand signed framed prints of any cartoon, please call for pricing. Note: All art, photos and cartoons appearing on this website are protected under copyright law by John Stinger and may not be used or reproduced without prior written approval from the artist. © J. Stinger. All rights USA and international reserved.